The Model S base model will be priced at about $57,000, before a $7,500 U.S. federal tax credit, for a car that can travel 160 miles on a full charge. DETROIT (Reuters) -- Tesla Motors Inc. said today it will begin delivering its Model S sedan to customers on June 22, identifying the date for the launch of the electric carmaker's most crucial launch yet. The company said several customers will receive their cars that day in an invitation-only event at the Tesla factory in Fremont, Calif.
Tesla had previously said sales of the Model S would begin in June, ahead of earlier July projections. "In 2006 our plan was to build an electric sports car followed by an affordable electric sedan, and reduce our dependence on oil," Tesla CEO Elon Musk said in a statement. "Delivering Model S is a key part of that plan and represents Tesla's transition to a mass-production automaker." Tesla, which said test-drive events for the Model S will begin in select North American cities in July, reiterated that it plans to deliver 5,000 Model S cars by year end. Reservations for the electric car top 10,000. Although the Model S has not received a crash test rating from the National Highway Traffic Safety Administration, the company said in a statement that it has completed Federal Motor Vehicle Safety Standards tests, allowing the Model S to go on sale. “The star rating is assigned by NHTSA after they perform their own validation test. Tesla has completed all required FMVSS tests and we believe that the performance we have observed will yield a five-star rating from NHTSA,” Tesla said in a statement. Tesla has described 2012 as a "year of two halves" with the Model S launch as the dividing line. Ninety percent of the company's revenue this year is expected to come from the sedan. The Model S base model will be priced at about $57,000, before a $7,500 U.S. federal tax credit, for a car that can travel 160 miles (258 kilometers) on a full charge. More popular, the company previously said, will be the Model S version that will be able to travel 230 miles (370 km) on a full charge. That version will cost $10,000 more. 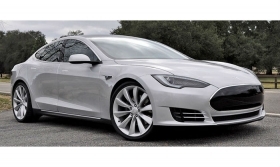 A version of the Model S that will have a range of 300 miles (483 km) will cost another $10,000. Mark Rechtin contributed to this report.